This is my salad, nacho salad! It’s no secret that I’m a nachoholic. I love nachos, I always have. As a kid in the summertime when we were out of school, I would make nachos for breakfast and eat them while watching soaps. Unless of course I opted for queso instead of nachos. I’m also pretty sure that “nacho queen” has been used more than once in reference to myself. Sometimes I fancy them up with all kinds of toppings, sometimes I take the time to spread bean dip on every chip, and sometimes I just want plain old melted chips and cheese. The only problem with nachos (a sad, sad problem!) is that they aren’t exactly good for you. As a person that could quite literally eat nachos every day, I came up with this recipe to provide a little lighter option. Because you know, waistlines expand. 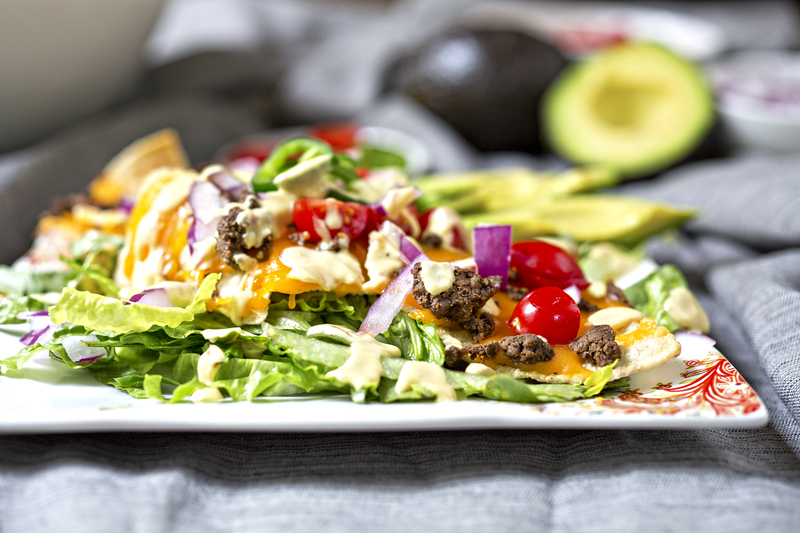 I was trying to figure out the best way to combine salad with nachos. Do I leave the nachos on the bottom and put all the salad on the top so you could grab the salad part in between two chips? That seemed like it would only end up in a hot mess all over the place. Ultimately I decided on this configuration: lettuce, nachos, lettuce toppings. It worked pretty well, the only thing is that it’s not exactly finger food. Yet the nachos themselves are not exactly fork food. Quite the conundrum. We found that with the nachos more broken up it was much easier to eat it all like a regular salad. This can be done one of two ways: start with broken up chips, or break up the nachos right out of the oven before putting it on the salad. If you have a bunch of broken chip pieces at the bottom of a bag, this would be a great use for them. Feel free to try it any different way. If you manage to turn this into finger food let me know how it works out! When it comes to making the nachos, you can do it in the microwave if you must, but, they are much better when broiled in the oven. Some of the chip parts that poke up closer to the burner start to get brown and it all just seems more roasty. Take it from me, I’m the nacho queen, remember? 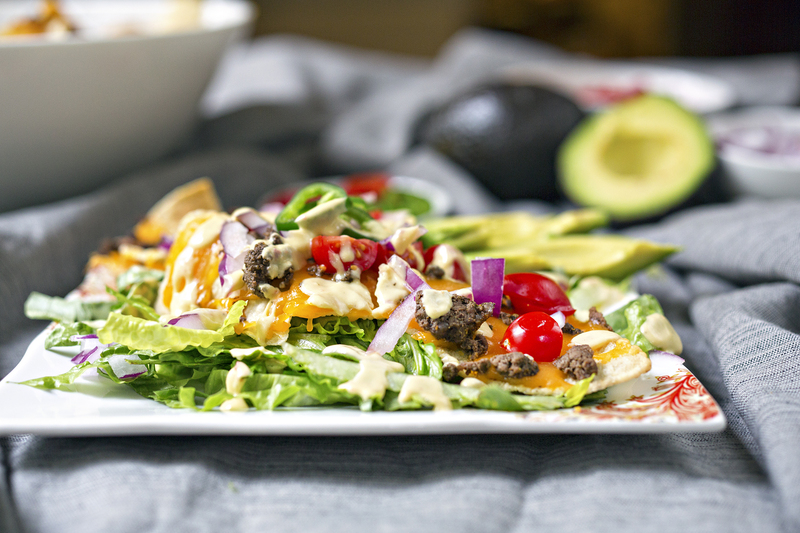 Just keep an eye on them – nachos under the broiler cook up in about three minutes. Lastly, the avocado crema. The first time I made this I thought “Well, what am I gonna do with all of this? It’s a garnish.” Then everybody smeared it on everything in sight. Here, I loosen it up a little with extra lime juice and some water so it works a little better as a “salad dressing” of sorts. Start by browning the meat in a skillet over medium high heat with the cumin, chili powder and salt and pepper to taste. While that's cooking you can chop your veggies. Put your lettuce in the bottom of either a big serving salad bowl or individual bowls. Combine all the ingredients in a blender and blend until smooth. For a drippier consistency, add a little water or make sure to use a thinner yogurt. Set the oven to broil with a rack at the very top. On a foil-lined baking sheet, spread out the chips and cover with the cooked meat and cheese. Broil until the cheese is melting and pieces of chips poking out are just starting to brown, 3-5 minutes. (Keep an eye on it!) Once the nachos are done, roughly break them up a little with a spatula and put on top of the lettuce. Top with tomatoes, onions, avocado slices and avocado crema and serve immediately. Non game substitution: Use ground anything! Beef for something fattier, turkey for something lean. Vegetarian substitution: I’m partial to black beans instead of the meat, but you could also just leave the meat out and use plain nachos.